HACKENSACK — City Manager Steve Lo Iacono remembers the Hackensack of his childhood, when the city was a center of commerce. A destination. "Historically, it was the center of Bergen County," Lo Iacono told NJ.com recently, adding that the presence of hospitals, several major highways and rail lines and the central offices of county government made the city a destination. "Those factors haven't changed." 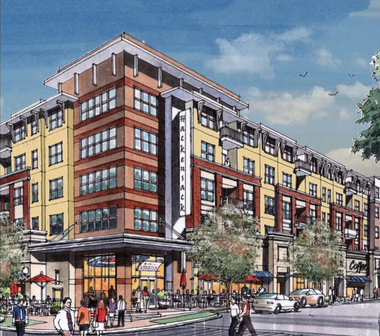 An artist's rendering of a revitalized, mixed-use downtown Hackensack. What has changed is the rise of automobile commuting, which sent city-dwellers all over America into the suburbs over the course of a few decades. Hackensack isn't alone in its struggle to draw people back to its downtown, and now officials here are trying to implement the recommendations of a lofty "downtown rehabilitation plan" that it commissioned from the Hasbrouck Heights-based DMR Architects. The focus of the study was an ambitious overhaul of zoning laws in a "rehabilitation area" of 389 existing properties across 39 city blocks, spanning a total 164 acres. It recently received unanimous approval from the city's planning board, and public hearings are slated for June. Project Manager Francis Reiner says there was another subtle force that sent businesses and residents away from the urban center: Municipalities all over began enforcing single-use zoning laws, relegating one section of a city to commerce and another to residential space. He said peeling back those restrictions, allowing living space above first-floor storefronts, creates a vibrant downtown. "We have to change the tools and the mechanisms to allow that kind of development to occur," Reiner said. "This plan does that." The proposed rehabilitation area spans from the county administration buildings at its southern end up to University Plaza Drive. Lo Iacono says the plan looks to build on the the city's strengths — its diversity, easy access to public transportation among them — while respecting the architectural and historical character of the city. DMR ArchitectsThe proposed rehabilitation area spans from the county administration buildings at its southern end up to University Plaza Drive. "We're not looking to have someone bulldoze Main Street from the Court House to Sears and put up skyscrapers," he said. The proposal, spelled out in a lengthy report issued by DMR Architects in April, calls for a streamlined permitting process that will help developers seeking approval of downtown construction projects cut more quickly through red tape. But they also take a bold stance on what the city will and won't permit, spelling out in black and white the kind of structures they want — and what they don't. "A developer doesn't know if brick or stucco or vinyl is something the city wants or doesn't want," Reiner said of the current planning and zoning processes. "He's got to spend a lot of money making a presentation that might not go anywhere. These standards come out and say it." Vinyl siding, for example, is a no-go for store fronts. As are plastics, "simulated materials," smoked or tinted glass and acrylic materials. In their place it recommends materials like wood, metal, glass and brick — an emphasis is placed on "durable materials." While the requirements and recommendations may be prescriptive, Reiner contends that they only spell out in writing what a zoning board would tell a developer later on in the process. "It's not overly prescribed," he said. "There's a certain amount of flexibility in the plan." Ultimately, he said, "We want active first-floor uses. That's what makes a city great." As examples, Reiner points to nearby cities like Morristown, New Brunswick, Hoboken and Jersey City, all of which have achieved downtown revitalization to varying degrees. Meanwhile in Fort Lee, the borough is currently wrestling with how to go at a similarly ambitious $1 billion mixed-use project just south of the George Washington Bridge. Because so much of the plan relies on private investment in development, it's hard to gauge the ultimate cost of the undertaking, but Lo Iacono points to the praise the plan received from Hackensack-based developer David Sanzari at the April 18 city council meeting where it was unveiled, an endorsement that he said "spoke volumes." "We know there are a lot of developers that want these types of projects," Lo Iacono said, while acknowledging that they'll have to overcome "long-held beliefs of how people look at the city." But the plan also recommends changes to the city streets themselves, including converting the one-ways like Court Street and Bergen Street to two-way roads, and a widening of pedestrian sidewalks, which will require significant public investment. Lo Iacono said implementation of the plan "will probably force our hand" on a $1.2 million overhaul of the city's storm water sewer system, which is over a hundred years old and frequently overflows into the Hackensack River during storms. "It needs to be done anyway," he said. "We know we need to do it." The possibility of major development projects being undertaken at the same time as a major renovation of the Bergen County Justice Complex doesn't seem to faze the city manager, either. He points out that the construction will be focused downtown, and that major thoroughfares like River, Passaic and Essex streets won't be impacted. Too much construction, he says, doesn't rank among his concerns. "I hope I have those problems," he said. HACKENSACK — Business owners talked Thursday evening about a revitalized downtown lined with five-story residential buildings, a two-way Main Street and more outdoor eating if the City Council approves a proposed zoning change later this month. The third annual Upper Main Alliance business expo drew almost 200 people to the Bergen Community College building on Main Street, where Jerry Lombardo, the organization’s chairman, unveiled posters with some of the leading proposals for revitalizing the city’s downtown. The council is expected to vote on June 27on zoning changes that would the proposals possible. Lombardo told the crowd that he envisions a day when there will be “several thousand units of housing” in the Main Street area. “Tonight, my heart is racing,” he said. The Planning Board last month recommended making zoning changes to allow residential buildings with ground-floor retail and office space on Main Street, an area where residential buildings are largely barred under the city’s current zoning code. The proposed zoning would allow five-story buildings along Main Street and 14-story buildings for some large-scale projects, said Francis Reiner of DMR, a Hasbrouck Heights-based redevelopment consultant hired by the city. He said 14-story buildings already are allowed in the area but developers won’t build them, or much of anything else, because of parking requirements and restrictions on residential buildings. Mixed-use zoning, allowing residential buildings with first-floor retail, has been the blueprint for redevelopment of other downtowns, he said. The new rules also would reduce the number of parking spaces that businesses are required to provide. The master plan was amended in 2006 to allow the area’s zoning to be changed, Reiner said. Last year, the city designated a 163-acre, 39 block area along the Main Street corridor as an area in need of rehabilitation. Thursday’s exposition included dozens of booths manned by local business owners, a Hackensack police officer on a Segway to promote new downtown patrols, an acoustic band and cheerleaders who did back flips. Corrado Belgiovine, of the Alexander Anderson Real Estate Group, said the zoning changes would create an atmosphere similar to Hoboken, Jersey City and Englewood. “It can happen here,” he said. Lucy Wildrick, of Street-Works Development in White Plains, N.Y., said her company is interested in building in the area but told city officials that zoning changes would be needed. She said she also would press for Main Street to be converted from one-way to two ways to make it easier for people to get around. She said she envisions Main Street being developed in sections, with office buildings near the Superior Court building that include some apartments, and more residential buildings farther north. Reiner said the city would create a technical review committee, as many other towns have done, to discuss ideas with developers before they apply for permits. HACKENSACK — The city council approved an ambitious rehabilitation plan Wednesday evening that city officials say will streamline development downtown. "After a lengthy public approval process and many long days working to put together a plan that best positions Hackensack to thrive, I am confident that we will now start to see progress in revitalizing our downtown with new residential, dining, and commercial options," Mayor Jorge Meneses said in a statement following the vote. The vote put into place significant changes to the city's zoning procedures, including specific guidelines for the materials and uses the zoning board will green light. In an interview with NJ.com in May, Francis Reiner of the Hasbrouck Heights-based DMR Architects, which drafted the plan, outlined the changes. He said the plan's main focus was shifting the city's ordinances from single-use zoning toward multi-use, allowing residences to exist above first-floor businesses. HACKENSACK — Developers are already showing interest in a recently adopted city plan designed to spark a downtown building boom and return the city to its heyday as Bergen County's retail and cultural center, city officials said Friday. Three developers have met with city officials in the past eight weeks to discuss tentative ideas, City Manager Stephen Lo Iacono said. Several others have made telephone inquiries about opportunities created by the city's downtown revitalization plan, which eased zoning, parking and other restrictions in a 39 city block-area known as the city's Main Street corridor. "We're delivering the message that we're very receptive to developing," Lo Iacono said. "We're open for business." City officials would not reveal the names of the interested developers, and those Lo Iacono contacted for this story declined to talk with a reporter for fear of exposing their plans to competitors, he said. But all of them want to build the type of mixed-use residential and commercial projects the city — like many communities with blighted urban areas — are trying to attract, said Francis Reiner, a planner with DMR Architects in Hasbrouck Heights who is a consultant on the project. "This really brings Hackensack to the attention of all those types of developers that have previously been going to other communities," he said. Reimer and others who worked on the project said the city already has several characteristics that would draw developers, including dozens of preserved historical buildings of various architectural styles, government buildings, a major hospital and easy access to highways and public transportation. But previous urban renewal projects have been hampered by antiquated zoning, designed at a time when Americans were abandoning downtown areas for the suburbs and wanted separation between retail areas and residential neighborhoods. The 63-page Downtown Rehabilitation Plan attempts to bring requirements for new developers into line with the contemporary taste for downtown areas where people can live, work, shop and find entertainment, mainly by removing restrictions on residential developments with ground floor retail and office space. The proposal envisions buildings as high as 14 stories, side-walk restaurants and carefully maintained storefronts – which would adhere to a series of aesthetic requirements. Those changes will be followed by a study on how to improve parking in the city, an attempt to secure the $3 million in financing needed to start the first of three phases to repair the city's antiquated sewer system, and a streamlined approval process meant to allow developers to reduce up-front expenses. The parking study, considered a crucial step in the process, is due this week, Lo Iacono said. City officials are also considering a suggestion in the plan to convert one-way streets in the designated area — including Main Street and State Street — to two-way, which is thought to be more attractive to shoppers and businesses. Several commercial developers asked to weigh in on the plan Wednesday said they have been watching it with interest, but they were still skeptical. "In theory, it's a great thing for Hackensack," said Thomas Reilly, managing director of the real estate services company Jones Lang LaSalle in Parsippany. "But will the economy allow it to happen?" He said the city may need to provide tax breaks and other incentives to jump-start development, measures Lo Iacono said city officials will consider for the right project. Jon Hansen, chairman of The Hampshire Cos., a Morristown-based real estate investment company, said the parking changes will be crucial. "Without the parking, there will always be a high percentage of vacancy," he said. "If you attract the residential and provide parking, the retail community will revitalize." David Sanzari, who said his family-owned company, Alfred Sanzari enterprises, owns more than $60 million worth of property in downtown Hackensack, said he has no doubt the plan will work. "The hardest thing is to get these things started, who goes first," he said. "Once that happens, developers will come in, property values will skyrocket and we will be well on our way." The Hackensack City Council unanimously approved the adoption of a new downtown development plan designed to spur the economic growth of the city’s Main Street corridor at the June 27 council meeting. The redevelopment effort includes zoning changes to encourage economic and residential growth in the city’s downtown and restore its former commercial strength. The rehabilitation plan designates 163 acres, 39 city blocks and 389 properties consisting of Main Street and the surrounding area, remembered as a commercial and entertainment Mecca in the 1940s and 50s. The proposal incorporates a mix of new housing and businesses along with open space. Enhanced infrastructure, including improved roads and sidewalks, are also part of the plan. Planner Francis Reiner of DMR Architects noted the benefits of the plan’s new zoning proposals. "The zoning in this plan is intended to promote mixed-use development, active streets with two-sided retail, outdoor dining and a more pedestrian-friendly urban environment," he said. "The new zoning also supports existing property owners, existing businesses, the rehabilitation of those businesses and new development opportunities in the downtown area." Jerry Lombardo, chairman of the city’s Upper Main Street Alliance, looked ahead to how the area designated for redevelopment, bounded approximately by the Bergen County Courthouse to the south, the Sears department store to the north, State Street to the west and River Street to the east, will be changed for the better when the plan is executed. "We’re not reinventing the wheel — the wheel is already there, and we have to get it rolling in Hackensack," Lombardo said. "We have confidence in the plan. It does not contemplate any use of eminent domain or the taking of anyone’s property. Rather, it seeks through the power of the market to rebuild our downtown." City Manager Stephen Lo Iacono noted that he believed the success of the plan, to be implemented over the next ten to 12 years by the public-private partnership established between the city and the alliance, would not be jeopardized by the ongoing legal cost of police-related lawsuits. "There is no question that there is going to be increased tax ratables once this plan is rolling along," Lo Iacono said. "This plan will help us to underwrite all the costs of running the city in the long term. The legal situation is a serious situation, but a short-term one." Albert Dib, executive director of the Upper Main Street Alliance, felt that the approval of the plan could make history in Hackensack. "I think this is the most important thing to happen in Hackensack in my lifetime," said Dib, 40. "This plan solidifies Hackensack’s place as Bergen County’s center for commerce and culture. There are no other municipalities in Bergen County that can offer what we’re about to offer." In June, the Hackensack City Council unanimously approved an ambitious plan to transform the city's downtown shopping area into a modern district where people live, work and enjoy a nightlife. Lorraine Currence has been working as a hairstylist at Straight Nappy for seven years. 'That would be very good,' she said about Hackensack's downtown redevelopment plan. 'Main street is really dead. If we get a lot of pedestrian traffic that will bring business then I'm all for that.' "
That would be great because we really need some kind of business," said Rosayde Ramirez, 31, who has owned Phiefer's & El Portero restaurant on Main Street for six years. "Hackensack is very dead, especially at night time. I've been open 6:30 to 9 p.m. and there's no business after four o'clock." City Manager Stephen Lo Iacono said if he could address Main Street merchants he would tell them that if the plan is completed they "will have an awful lot more people in the district as potential customers. His property values are going to increase because all the properties around him are going to be significantly improved." The City of Hackensack Rehabilitation Plan, however, is a long-term solution that could take a decade to complete, said Lo Iacono. According to the detailed two-volume plan prepared by DMR Architects of Hasbrouck Heights, "approximately 163.80 acres on 389 parcels in 39 city blocks" would be transformed into a "livable, real and clearly defined downtown district." "What we hope to see is a mixed use area with many more people living in the Main Street district," said Lo Iacono. The plan has several major components starting with overhauling zoning laws, a goal that was achieved when the city council approved the plan. "Existing zoning is archaic," said Lo Iacono. "If someone wants to come in and establish a new business such as a restaurant, the old zoning laws governing parking, outdoor dining, setbacks from the streets, have made it impossible." Luis Ortiz, 40, would agree. He started his first business in Hackensack 20 years ago selling hot dogs out of a small shop. He now owns five businesses in Hackensack including MetroPCS and Detalles. "It's a Christian book store," said Ortiz. "We also do money transfers and shipping services." Ortiz rents six apartments above Detalles. Ortiz said he agrees that zoning laws can be burdensome on businesses. "They have rules but sometimes for a business owner it takes a lot of time and frustration to open a business," said Ortiz. "We want a merchant-friendly town." "We've had reputation that we were not developer friendly," said Lo Iacono. "We're making a very, very concerted attempt to change that perception." The plan calls for the "total restructuring of the parking system." said Lo Iacono. "Right now we have a tremendous amount of surface parking. It's not well placed. And people don't realize where it is." Lo Iacono said parking requirements were "impossible to meet." They have "established a system of shared parking" which allows spaces to be used by business and residents. The plan would "turn one way streets into two way streets," said Lo Iacono. "Signals, signage and intersections would need to be redone in some cases. It's a pretty significant undertaking. Everything that we've gotten from planners, developers says there are no successful downtowns that have a one-way circulation." Zoning law changes would encourage "Catalyst Development," which is a project analogous to an anchor store in a mall. "It's a project that could be transformative on Main Street," said Lo Iacono. According the plan, a Catalyst project would be "over 400,000 leasable square feet" (not including a parking deck) and up to 14 stories, or 176 feet tall, exceeding the law's 5 story limit. Lo Iacono said the first infrastructure project will address sewer and water changes. "We have a combined sewer system that runs through the downtown area right now and we're already taking the first steps to separate it so it can better handle the increased load." Lo Iacono said the first third of the sewer project will cost about $3 million. "That's not to say the whole thing is going to cost $9 million," said Lo Iacono. The city will borrow money to complete the project, which could begin next year," Lo Iacono said. "That's work that needs to be done whether we were doing this rehab or not," said Lo Iacono. "The sewer system in that area is really overburdened." Asked if the city has a cost estimate for the entire rehabilitation plan, Lo Iacono said, "No we do not." Whatever the final cost, Lo Iacono said the city will essentially borrow all the money. Hackensack has an $87 million annual budget and, according to the city's 2011 debt statement, they carry about $43.5 million in debt. According to the plan, possible funding mechanisms to pay debt include "levying a special tax assessment on all or a portion of a Catalyst Development Project," "allocating revenues generated by public parking facilities" and "the sale of public owned property to the designated developer(s) as part of a development project." As the plan moves forward, it's not only business owners who stand to benefit. Lorraine Currence has been working as a hairstylist at Straight Nappy for seven years. "That would be very good," she said about the plan. "Main street is really dead. If we get a lot of pedestrian traffic that will bring business then I'm all for that." Currence, who states her age as "old enough," said the economy has impacted her bottom line. "A lot of clients don't come simply because they can't afford it," she said while performing a weave, which can cost $100 and up. "And they have to put their priorities right. Some don't come." When asked his opinion about the plan, Leon A. Isufi, who owns Main Galaxy, an art gallery, custom framing and photo restoration store, said, "Stop lying because they have no plans. They try to put people to sleep pretending that they are working. But they've been saying that for the last 40 years." Isufi, 67, has owned his business for 33 years. He says his taxes went up $4,300 last year. "I get $18,000 rent from the store next door. I pay (Hackensack) $17,645. Basically I am working for the town, for their pensions, for their salaries, for their vacations, nepotism, favoritism, everything. "I own the building but I'm not the owner," Isufi said. "I work for them. They milk me like a cow. They take our money. They promise everything. In the end they do nothing." Albert H. Dib is the executive director of the Upper Main Street Alliance, a business improvement organization with a $360,000 annual budget funded through a mandatory assessment on 375 businesses on Main Street from Atlantic Street to Clinton Place. He supports the plan and says it could help to stabilize taxes. "When you get a fully rehabilitated downtown and when it's generating the taxes it should ... what you hope happens is you would see a general lessening of the tax burden," said Dib, who also works as a legal analyst for the city manager. "There's very little residential base," said Dib. "Nobody lives here. That's why mixed use become such an important element." Although a member of the Alliance's board of directors, Ortiz said he said he was not speaking on their behalf. He believes they can play an important role on Main Street. "In the case of cleaning and improving the storefronts and having a group organized so that everybody has the same goals, it's better right now," he said. "The downtown area in Hackensack fell into somewhat disrepair over the past 25, 30, 35 years," said Lo Iacono. "It was the shopping hub for Bergen County back in the 50s and 60s. Lo Iacono said "the onset of the highway stores, the big box stores and the flight to the suburbs" drove customers away from downtown. According to Lo Iacono, cities like Morristown, New Brunswick, Red Bank and Rahway have taken downtowns that were in trouble and achieved a transformation. He believes Hackensack can model the same approach. In September, the city has invited about 60 developers to review the rehabilitation plan, according to Lo Iacono. Despite current economic difficulties and high unemployment, Lo Iacono says the rehabilitation plan will "put us in the position to take advantage of the rebound when it comes." The Pre-Application Review Committee is a very good idea. If the city really wants to tell the world that it is open for development in this downtown redevelopment district, that's the way to do it. HACKENSACK — Developers looking to build in the city would get more guidance under a streamlined process that is scheduled for Planning Board review. Nancy Kist, an attorney at DeCotiis, Fitzpatrick and Cole who worked on the new procedures, said the changes are intended to save developers both time and money. She could not immediately say what the new fees would be, but she said most of them would be lower. Developers could also save money by identifying problems with their applications before they begin the costly hearing process, she said. The changes are part of a city plan designed to spark a downtown building boom and return the city to its heyday as Bergen County's retail and cultural center. "I am confident these new measures will be well received by our Planning Board and potential investors in our city," Hackensack Mayor Mike Melfi said. A city press release outlining the proposal did not say when the Planning Board would review it, but the board's next scheduled meeting is Sept. 12. The city approved a 63-page Downtown Rehabilitation Plan in June, easing zoning, parking and other restrictions in a 39 city block-area known as the city's Main Street corridor. The plan aims to bring requirements for new developers into line with the contemporary taste for downtown areas where people can live, work, shop and find entertainment, mainly by removing restrictions on residential developments with ground floor retail and office space. City officials envision buildings as high as 14 stories, sidewalk restaurants and carefully maintained storefronts. Changes in the furute would also include improved parking, repairs to the city's antiquated sewer system and the re-introduction of two-way traffic on Main Street. • A committee of city representatives who would review developers' pitches before they are formally presented to the zoning or planning boards. • Forms and checklists to help developers through the application process. • A revamped fee structure that city officials said would be more aligned with costs in surrounding communities. See Press Releases and more information here. City council members have taken one more step toward reaching their stated goal of making Hackensack a more developer-friendly community by proposing a simpler, more streamlined and transparent construction permit approval process. According to City Manager Stephen Lo Iacono, the goal is to "make the application process more efficient and less cumbersome." The proposed Pre-Application Conceptual Review Committee (PACRC) would amend the city's Land Use Ordinance. The committee would "informally review proposed development applications that are brought before it on a voluntary basis by applicants; and acquaint the applicant with, among other things, the City's Master Plan, zoning regulations and other sources of information that may aid the applicant in preparing a submittal to the Planning or Zoning Board." The proposal is part of an effort to jump-start the ambitious City of Hackensack Rehabilitation Plan, a long-term project that seeks to modernize, revitalize and transform a 163.80 acre section of the business district into a thriving downtown where people live, work and enjoy a bustling night life. The Rehabilitation Plan, which was approved by the city council in June, overhauled zoning laws which were called "archaic" by Lo Iacono. "It's based on the past where it's been very, very difficult for someone who wanted to come in," said Lo Iacono. "The paperwork had been onerous. The application process had been terrible. A developer had to invest a lot of money just to get ready to submit an application." PACRC applicants would be charged $500 for the "informal review" and, according to the proposal, "any statements or recommendations made. . . shall not have a binding legal effect on the Planning Board, Zoning Board of Adjustment or any city representative participating in the PACRC." The city recently held a meeting with developers who, according to Lo Iacono, expressed support for more clarity in the application process. Lo Iacono said developers "expressed a desire for a process like this." "This will require a lower level of information and detail, initially, when submitting an application for a project," Lo Iacono explained. "The end result, when all is said and done, you need to have the same amount of detail. But in the first step you have the initial kind of fear of spending a lot of money and being rejected. That has been removed to a certain degree." Final passage of the PACRC proposal is scheduled to be considered at the city council meeting on Oct. 16. City leaders and business owners are seeking a compromise solution regarding a plan to convert a downtown parking lot into a public park. The current parking lot — located Atlantic and Warren streets — contains 52 metered parking spaces and is adjacent to where the city is renovating a new 9,000 square-foot cultural arts center, located at Atlantic and State streets. According to City Manager Stephen Lo Iacono, current plans for the park include a gazebo performance space that can accommodate about 200 people. "The city would reduce that to about nine spaces and the property owners are not happy," said Joseph R. Contaldi, 57, an attorney who owns part of the Landmark Building at 27 Warren St. "There are a number of commercial businesses that border that parking lot and their clients and customers use that lot." Contaldi, in an interview after the meeting, who is the "point-person" for concerned businesses, said there have been "meetings, discussions and letters of dissent" written. "In that building alone there are in excess of 20 attorneys, two accountants, a realtor and a publishing company," said Contaldi. "And that's our building alone." Contaldi's building also houses his own law office and 14 condominium units. "We're not losing the spots because we are replacing them," said Lo Iacono. Lo Iacono also said that a parking consultant found that the parking lot is underutilized. "There's 52 spots," he said. "Of the 52, 14 are leased on a monthly basis by tenants in that building. Of the balance of 38, there is utilization of less than 50 percent of the time. Over 50 percent of the spots were vacant the majority of they day." Moreover, according to Lo Iacono, "We're going to be creating some on-street parking … and creating another 40 spots on the ground level of a garage on the same street." Speaking at the Committee of the Whole meeting preceding the council meeting, Councilwoman Karen K. Sasso supported the Atlantic Street Park as a complement to the arts center. "I think that anybody who's against it is just obstructing the future of Main Street," said Sasso. "I'd love to be able to review it and see if we can come to some sort of compromise." "We don't want to be obstructionists," said Contaldi. "The property owners in the area are hoping to reach a compromise with the city and avoid litigation." Contaldi said the compromise would allow businesses to "retain approximately half the parking spaces. The city will have a park next to the culture center." The City's of Hackensack Rehabilitation Plan, an ambitious multi-year project that seeks to revitalize the downtown area with new businesses, housing, civic and cultural institutions, devotes four pages and several additional references to parking issues. Lo Iacono asserted that the creation of Atlantic Street Park conforms to the needs of the Rehabilitation Plan. The plan's document, prepared by DMR Architects of Hasbrouck Heights, contains a conceptual design drawing of the arts center and the proposed park. According to Lo Iacono, park construction plans are essentially on hold. "There is no timetable right now," he said. "We're hoping to get this issue settled without pain." HACKENSACK — The rehabilitation of Hackensack’s downtown district will span a larger area after the city moved to include additional lots on State Street in the rehabilitation plans at the Nov. 20 council meeting. Lots on State Street were recently added to the Hackensack’s Downtown Rehabilitation Plan after being determined that they met the requirements of an area in need of redevelopment. The approval came after last month’s planning board meeting where a public hearing was held in connection with a preliminary investigation to determine whether certain lots on State Street, as well as one located on Warren Street, constitute an area in need of rehabilitation under the newly approved Hackensack Downtown Rehabilitation Plan. "The [new lots will now be included] within the Main Street rehabilitation program," Hackensack City Manager Stephen Lo Iacono said. "It’s a site on State Street which the planning board has designated, and the council has approved a designation for, as an area in need of redevelopment." The lots in question are located at addresses: 76, 86, 92 and 94 State St. as well as 31 Warren St, according to Lo Iacono. Though the planning board carried out the initial investigation as to whether it should be included in the city’s redevelopment, and the council approved the designation, the following step is, once again, in the planning board’s court. "The council sent to the planning board a draft of the redevelopment plan for that area and the planning board will be acting on that at their next meeting [in December]," Lo Iacono said. City Planner Francis Reiner of the firm DMR Architects further explains the process. "There are statutory requirements in order to meet the designation of an area in need of rehabilitation, which the [approximate] 160 acres of the downtown met that criteria," he said. "We went through that process. Once that area is designated, we changed the zoning in the area of the downtown to allow for pedestrian friendly, mixed used development to occur anywhere in the downtown — commercial, residential, retail, office…essentially a property can be redeveloped at any point now, within the rehabilitation plan, so long it meets the criteria that was adopted in that plan." According to the Downtown Rehabilitation Plan the criteria for the rehabilitation of a particular site is met when "a majority of the storm water and sanitary sewer infrastructure in the delineated area is at least 50 years old and is in need of repair or substantial maintenance." Main Street is the substantial part of the Hackensack’s downtown district. The 63-page plan was proposed, and subsequently passed in June, with hopes of revitalizing the area thus bringing in more revenue into the city. According to a press release from the City of Hackensack, the rehabilitation plan will include "new housing, retail and restaurant options that maximize [the city’s] strategic advantages in the region." Furthermore, one of the main expectations for this plan is "to create a new economic engine for Hackensack, bringing new value to current business and property owners and [attracting] new businesses and residential options…[the plan positions Hackensack] to see new investment in projects that will create jobs, increase [its] tax base and strengthen existing business." An important component of the approved plan also makes a point of establishing "a balance between pedestrian and vehicular transportation, as well as an element protecting existing historical sites," according to the city. The rehabilitation will ease certain restrictions — such as zoning and parking — in an area equivalent to 39 blocks. This area is known as the city’s Main Street Corridor. However, Reiner said the main process behind the plan is quite simple, since "the city is going to look to make public infrastructure improvements — storm, water, sewers, etc. — [and] change the zoning, allowing developers to take advantage of appropriate zoning in urban areas. The city believes that, that is going to spur private development to revitalize the downtown." Reiner said that the plan is already coming into fruition. "[The city has] a developer that is looking at a 200-unit project," he said. "The city has met with numerous other developers on other available properties in the downtown and so we think that over the next six to eight months, we’ll have announcements on a number of projects." HACKENSACK — The City Council took a first step on Dec. 18 to transform a State Street block characterized by gravel lots and unoccupied buildings. The Council introduced an ordinance that designates several lots between Warren and Bergen streets as an "area in need of redevelopment." The State Street redevelopment plan changes zoning laws to encourage high-density mixed-use developments and allows for up to 230 residential units. "I am confident that in the coming months we are going to be announcing new projects that will transform our downtown and really begin the process of returning Hackensack to the center of activity in Bergen County," Mayor Mike Melfi said in a statement. The State Street redevelopment plan is part of the Main Street Rehabilitation Plan. Adopted by the council in June, the plan is to overhaul downtown Hackensack by easing the building process, changing traffic patterns and pushing more mixed-use development. The City unveiled the plan to developers in September. It received high praise from William Procida, president of Procida Funding and Advisors. "It's everything you want to hear," he said. "Municipal cooperation, good design and everybody's on board." The Council is scheduled to vote to give final approval to the State Street redevelopment plan at its Jan. 8 meeting. HACKENSACK — The Hackensack City Council was presented with, and subsequently approved, the introduction of an ordinance adopting a redevelopment plan for State Street during their Dec. 18 council meeting. The Hackensack City Council approved the introduction of an ordinance adopting a redevelopment plan for State Street, a month after it was determined the street would be part of the overall Downtown Rehabilitation Plan. The plan entitled "State Street Redevelopment Plan for Block 209, Lot 8, 9, 10, 11, 12, 13 & 15" was already presented, and unanimously approved during the Planning Board's Dec. 12 meeting. The lots in question are located at addresses: 76, 86, 92 and 94 State Street as well as 31 Warren St.
During the planning board meeting, Councilwoman Karen Sasso addressing those present, stating her happiness and satisfaction with the proposed plan. "I am very excited for the city," she said. "This [redevelopment] will be great for our city and a new start for our downtown." During council meeting, Hackensack Mayor Michael Melfi expressed his support of the plan. "This is an exciting time for [the city]," he said. "This is a significant step forward [in the overall Downtown Rehabilitation Plan]…I hope this is the spark to help ignite the start of [entire downtown redevelopment]." The State Street Redevelopment Plan calls for a six story residential building to be built on the lots on State Street and the one lot on Warren Street. According to City planner Francis Reiner of the firm DMR Architects, the State Street redevelopment plan's residential building will have a minimum size of 625 square feet per residential unit. The entire building will house a minimum of 136 units and a maximum of 230 units, said Reiner. The plan also calls for each residential floor to include "a minimum of one common room (excluding laundry) of not less than 350 square feet" and "a fitness center of not less than 750 square feet." "We continue to make progress in revitalizing our Main Street Corridor with unanimous consent on our plan to move Hackensack forward," City Manager Stephen Lo Iacono said in a press release. "We are going to see change in the coming months that will get peo-ple of Hackensack excited about the future of our city. Residential development remains a core part of what we are trying to accomplish on Main Street, and this is a first step in that goal." The 63-page Downtown Rehabilitation Plan was passed this past in June, with hopes of revitalizing the area thus bringing in more revenue into the city. "The city has met with numerous other developers on other available properties in the downtown and so we think that over the next six to eight months, we'll have announcements on a number of projects," Reiner said. "I am confident that in the coming months we are going to be announcing new projects that will transform our downtown and really begin the process of returning Hackensack to the center of activity in Bergen County," Melfi said. According to the city, if the State Street Redevelopment Plan is approved, it will be the first substantial residential development in Hackensack's downtown district in over three decades. Now that the introduction of the State Street plan has been approved, the City Council will vote on the ordinance at its Jan. 8 meeting. I am very happy about this. A bit overdue, but progress comes in phases. It's more than just having new residents with disposable income living only a block from Main Street. The very act of constructing such a luxury building in the downtown will spark more construction, more investment, and more tax ratables. There will be an up-spiral instead of a down-spiral. There will be more business owners eager to locate stores or restaurants on Main Street. The same logic applies to the vacant 30 acres at the Record campus. It's also the same distance from Main Street. Don't let that be a big retail strip center of any sort, WalMart or not. That has to be mixed-use with a majority residential component. And try to incorporate the vacant County lot and the former County Probation building, and add a footbridge over River Street somewhere between Mercer Street and the old Probation building to tie it all together. And the next time ANYONE digs a major foundation in Hackensack, whether it's the State Street property, HUMC, or anywhere else, try to put together a deal to get the clean fill from the excavation dumped at the Record Campus and the Probation lot. It costs money to dispose of excavation, especially dirt. If it can be certified as "clean fill" and there's no tipping fee to dispose it, it's just the cost of trucking it across part of Hackensack. All that land needs to be raised out of the flood plain, so it will be more attractive to build.